MACIAS PR was founded by a former Executive Producer with NBC and Senior Producer with CBS in New York. Journalists and industry peers consistently rank MACIAS PR as one of the best PR Firms based on our media deliverables and expertise. In 2017 and 2018, digital marketing peers named MACIAS PR the Strategic PR Firm of the Year. As part of the selection process, marketing and PR professionals reviewed the media campaigns promoted by our firm. A detailed summary of our approach and media deliverables was required for the nomination. More than 80,000 digital marketing, PR firms and publicists were nominated from across the country but MACIAS PR was the only firm selected in the USA. Finance Monthly also named us the 2015, 2016 and 2017 PR Firm of the Year – USA. Journalists with the finance publication reviewed our media deliverables, expertise and innovation in PR as a prerequisite for the award. We were the only PR firm selected in the USA under that category. You can read more on those honors and awards by clicking here. NEW YORK, April 4, 2019 (Newswire.com) – The top tech and healthcare PR firm — MACIAS PR — has released its first quarter publicity report, detailing the media coverage it secured for clients from January to March 2019. In January, MACIAS PR secured a TV segment with the top-rated morning show, the NBC Today Show, the showcased the world’s first smart belt, reaching more than 1.4 million viewers across the country. Over the course of the media campaign, MACIAS PR also secured publicity for the health tech client on Entrepreneur, USA Today, Forbes and others. There are advantages to being a media insider. You better understand how to get a story on the news from an editorial perspective. It also gives you a behind-the-scenes look at how the operation works. There’s a little-known used tactic that MACIAS PR applies to many of our TV campaigns. It’s an approach I learned during my time as a producer with local TV in Phoenix and Miami. There were many times when I had to find a day-of-air story on a moment’s notice. I frequently turned to the in-house feeds to find new ideas. Every local TV station subscribes to affiliate feeds that deliver video and stories into their newsroom. Many of these stories are from other local markets – but if executed properly as a producer – you can frequently take a story from one market and run it in your own. It’s the perennial crisis communications question for all industries: how do you control negative news once it’s out? And when you know more bad news is coming, how do you release it? The end-game strategy of crisis communications is to get your business out of the news as quickly as possible. You don’t want a story to linger, or new developments to unfold because it keeps your story in the news cycle. News is always about advancing a story. During my time as Executive Producer with NBC, we would frequently see a story in the morning’s New York Post or Daily News – and try to figure out how to advance it. No one wants to read old news. It’s why the phrase is a cliche. Every day new information unfolds about your scandal, the more heavily favored your story is to remain in the news. Earned media is not about advertising your services to reporters. Journalists aren’t there to listen to a sales pitch. Their job is to identify the news angle. MACIAS PR works with clients in different industries – healthcare, technology, digital health, nonprofits, consumer services. Our team is constantly speaking with journalists, reporters, writers and producers about news stories, across journalism beats. Even though our stories vary by industry, we never push promotional material to reporters. It’s a critical differentiator that separates MACIAS PR from other PR firms. We only sell the news story that positions our client in the center of it. Everyone needs a gimmick, especially in New York City. If you want to stand out at a cocktail party or crowded lounge, you need something to push you above the crowd. Some people call that personality; others call it charisma. I call it a gimmick. It’s no different with branding a product, business, or service. You need to discover what your gimmick is to get noticed, regardless of what you are selling. Now before the critics start mincing words and breaking down my statement with comments like, “That is shallow,” or “Execution beats style,” or “Hype loses to substance,” ……yeah, yeah, yeah, I get it. But let’s take off that analytical, argumentative cap for a second and discuss this idea in the gray world we live in today. There’s a lot confusion around PR and SEO. I hear it frequently from both clients and potential clients, as they co-mingle these two terms. PR and SEO might seem similar on the surface but their approach requires a different strategy and execution. Both have different objectives, and that end-game requires a different pregame. Let’s start with SEO. Google doesn’t reveal much about its search algorithm but they have revealed publicly that content plays a pivotal role in search ranking. Quality content gets a higher ranking with Google, moving you up to the first page. How you market that content also influences your ranking. I’m going to open up to you. In hindsight, I wasn’t a “yes” producer. I was always looking for the next big story to tell. And when we debated stories in the morning meeting, I continued to sell it even after the story was rejected. That approach must have worked because NBC promoted me to one of youngest Executive Producers in New York. Fast forward to today. I just read an article in the Harvard Business Review that can help your business when it comes to managing creative people. It’s titled, “What Stan Lee Knew About Managing Creative People.” The article will also help you get the most out of your PR firm. 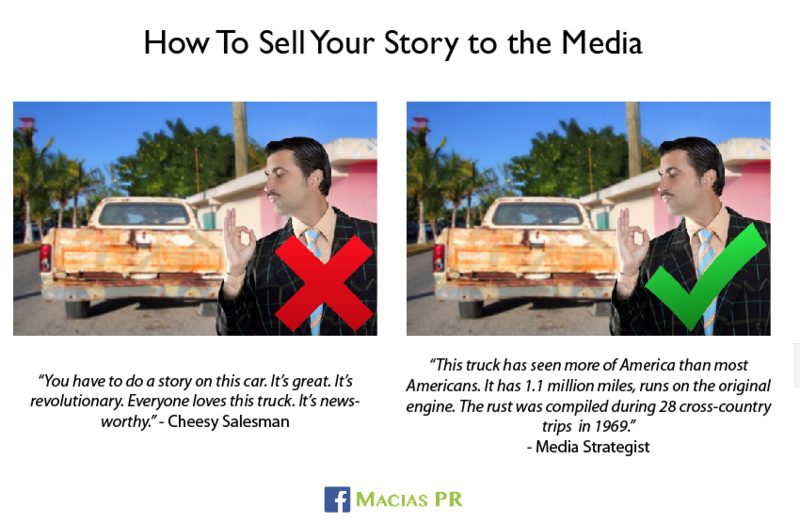 MACIAS PR takes this same approach with our media strategy. We continue to search for creative enterprise angles that haven’t been told before. And we are relentless. Just today, a CBS reporter said he finally sold his bosses on our story. We’ve been working him for weeks now and it paid off. But what does this have to do with your business? If you want to hire a creative PR firm, let them do their jobs. Yes, you know your industry but hopefully you trust them enough, along with their strategy. Let your PR firm run and challenge the status quo by coming up with the best enterprise angles for your business. You will help your PR firm by offering new ideas and keeping your publicists alert of new developments. At the same time, the best PR firms – like MACIAS PR – will continue to search for new ways to position you with the media. According to HBR, creative people need to keep busy; they want credit; they’re always dreaming big; and they want money. It seems like common sense, but if the Harvard Business Review published a study on it, maybe more people need to be reminded of it. Give credit to your PR team, even if it’s just internally. It will work wonders for your business down the road when no one is watching. And if they’re helping you sell more products and services, tell them. As an entrepreneur, you have to learn quickly what are your weaknesses and strengths. Sure, when you’re starting out, you have to do everything from billing to bookkeeping to the actual work. But as you scale, the workload needs to be delegated. You need some business hacks. I speak with startups all the time who tell me they tried to get PR on their own. They tell me they listened to Mark Cuban who said it is easy to get PR and spent hours, days and even months trying to get a story on the news. That money and time could have been better spent on growing their own business. I don’t know accounting or bookkeeping, but my business needs that function. I could (and I have tried) to learn Quickbooks and even do my own taxes, but that wouldn’t be an efficient place to spend my time. My expertise is the media. My business is PR. I’m better served by spending my time on what I know.